Our property provides lush views of the surrounding landscape. 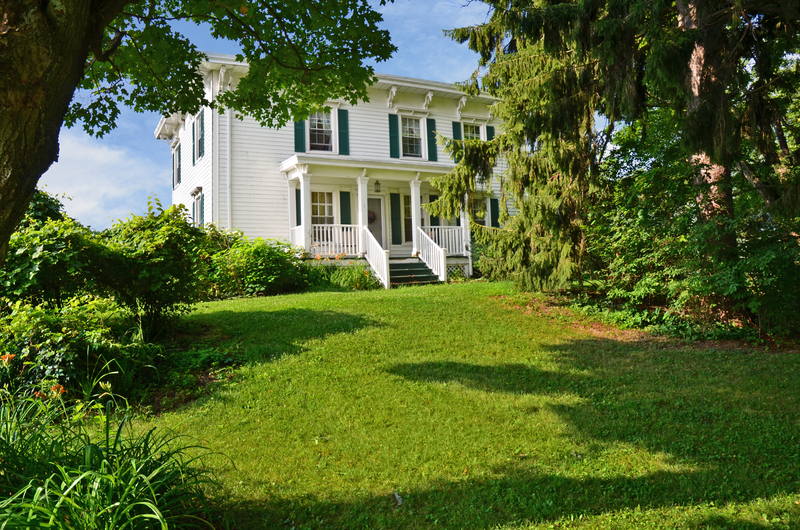 The home is an Historic 1859 Farmhouse renovated to provide modern amenities while maintaining it’s original character. You can enjoy The View from our two covered porches and from a second floor balcony. The property is situated in the scenic Village of Van Hornesville. We are 15 miles north of Cooperstown and just 8 minutes from the Glimmerglass Opera House – closer to the Opera House than many Cooperstown Properties. You will enjoy restful natural privacy as there are no other homes near this house. The address for the property is 1 H Moyer Road, Jordanville, NY, 13361. There is one very large bedroom with a King Size Bed. There is a spacious bedroom with a Queen Size Bed. There is a small bedroom with one set of Bunk Beds – suitable for children old enough to sleep in Bunk Beds. (Or for crazed Opera Devotees who will do anything to sleep this close to Glimmerglass and they drew the short straw in a group of adults looking for group accommodations!) There is also a Sofa Bed on the main level of the home. A Second Story Balcony, which we think is the BEST feature of this house… Because Of The View! A large fully equipped kitchen that includes an electric range; dishwasher; microwave; coffeemaker; blender; toaster; toaster oven; large refrigerator; quality cookware and utensils; china/flatware/glassware for 12++. There is also a large Gas BBQ. This home is equipped with DirectTV and Excede Satellite Internet & WIFI. There is NO landline telephone. This location has good cellular coverage with most carriers. There is no cable and no DSL in this rural location. Satellite Internet speeds vary depending on the amount of internet traffic and, believe it or not, the weather. Our internet speed is more than adequate for checking email and visiting most websites. However, you may not have sufficient bandwidth for streaming movies and/or online gaming. Other amenities include are an iron, ironing board and hairdryer. We are fully stocked with luxury bedding and plenty of towels. As is common with many historic homes the stairs in this home are VERY steep. There is a sturdy railing, but this property is not suitable for frail people, anyone with mobility or balance issues, nor is it suitable for toddlers. Nothing in this house has been baby-proofed. This home is situated on top of a rise. The location provides stunning views of the surrounding countryside. This location also provides an almost continuous breeze so the house tends to stay relatively cool. For this reason and in an effort to keep our carbon footprint to a minimum we do not have central air or air conditioners. Our bedrooms are equipped with ceiling fans or window fans. All windows have screens. A local Nature Trail, right in Van Hornesville, that features a beautiful gorge, spectacular waterfall, and natural limestone caves. Swimming in a Local Public Swimming Pool in the Summer (limited hours). The Van Hornesville Fish Hatchery – RIGHT across the road, very charming, and the perfect place for a summer picnic. Numerous Destinations of Historical Interest dating back to the Revolutionary War and before. Golf at the Otesaga Hotel or the Otsego Golf Club (one of the oldest golf courses in the United States). The rural charm and natural beauty of our area make outdoor activities hard to resist. Hiking and cycling in this area are very popular. There is great bird watching and wildlife viewing. Relaxing on the upstairs balcony or on one of our covered porches with a good book is also popular. There is a very large mowed area adjacent to the house should you wish to organize a game of kick-the-can or freeze tag. The water in this house is well water. Because of it’s high mineral content the well water is treated in a Softener System. The water is potable but most people do not care for the taste. We provide a Spring Water Dispenser stocked with three gallons of drinking water. If during your stay you wish to purchase additional drinking water it is available in three gallon bottles at the local supermarket. You can also purchase smaller bottles. Van Hornesville is a picturesque historic village. However, we are not a shopping destination – unless you count the local Feed Mill. Gas/Beer/Convenience is 5 miles away at the intersection of Route 80 and Route 20. The closest supermarket is a Price Chopper in Richfield Springs, 10 miles away. There are no restaurants in Van Hornesville. We are happy to provide a list of restaurants that are within a 20-mile radius. Let us know if you have any additional questions.